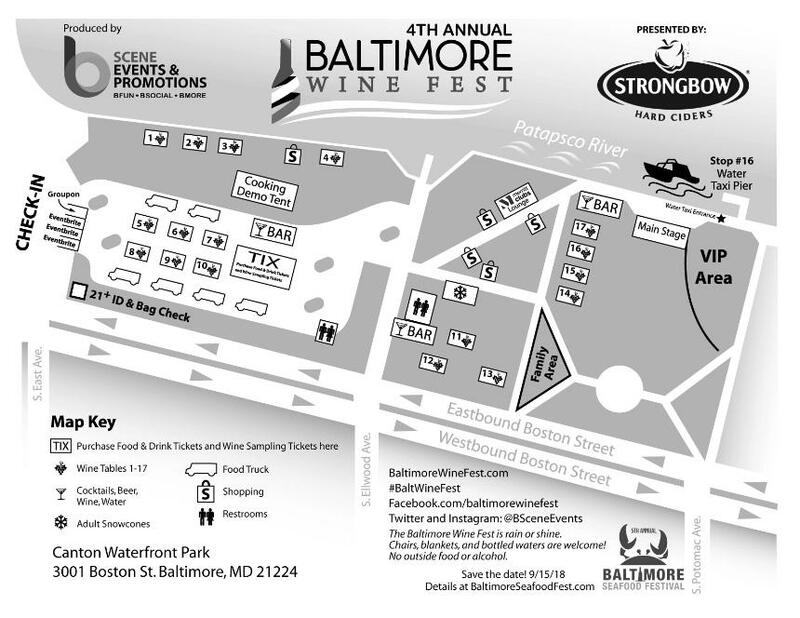 We are very excited for the 4th Annual Baltimore Wine Fest! Please review the event details below and hopefully this will answer many of your questions. Purchasing Tickets onsite – Tickets are going very quickly! We cannot guarantee the ability to purchase tickets onsite. Please purchase in advance at baltimorewinefest.com to secure your ticket. We will post on the festival website and on the main facebook page @4th Annual Baltimore Wine Fest if we are sold out of tickets. Please check in advance. Gates – VIP ticket holders may enter at 11am. We may open the gates a little early to get everyone else through the doors. While the restaurants, wineries, and bars will not be ready to serve until noon, you may enter and find a spot for your blanket and chair. There will be 4,000+ people and we thank you in advance for your patience as we get everyone through the event entrance. Be sure to have your ID’s out and ready and your tickets either printed or pulled up on your phone. VIP Ticket Holders – Please see the event map to locate the VIP tent. VIP ticket holders will receive early admission at 11am where the VIP tent will be serving bagels, pastries, and mimosas, $10 in food tickets, 15 wine tasting tickets, and open bar for 7 hours in the VIP tent. Guests will be allowed to order one drink at a time at the open bar in the VIP tent. There will be community seating and cocktail tables. Children are allowed in the VIP tent, but the seating and light fare is for VIP ticket holders only. Check-In – We will have a table for each ticket type (Eventbrite VIP, Eventbrite General Admission, Eventbrite Wine Tasting & Food, and Groupon. Please look at signs before entering a line. If you purchased two different types of tickets, please go to the appropriate line and send your guest to the appropriate line. Food/Drink Tickets & Wine Tasting Tickets – New this year – there are TWO different types of tickets. There are Wine Sampling Tickets which will be sold for $25 onsite and they include 15 wine samples. There will also be Food/ Drink Tickets (1 ticket = $1). Food & Drink tickets and Wine Tasting can be purchased at the Food & Drink Ticket tent (see map). Each restaurant and food truck will offer one small plate that will be priced for $5 (equivalent to 5 tickets). They will also offer larger plates. Broken Glasses – Please be very careful with your glass! If you require a replacement, there will be a fee of $3 (while supplies last). Please go to the Food and Drink Ticket Tent and our management team will assist you. Bag Check – We will have a bag check area prior to the event entrance – please see list of permitted items and non-permitted items. Items Permitted – Guests will be allowed to bring lawn chairs, blankets, sealed bottled waters and sunscreen. Items NOT permitted – coolers, tents, beach umbrellas, outside alcohol, outside food (baby food/ formula will be approved), weapons, and illegal substances. Pets – while pets are technically allowed, it is going to be hot and crowded, so we do advise owners to leave their pets at home. Pets are also not allowed within 20 feet of any restaurant tent per the Baltimore City Health Department. Dogs will not be allowed in the VIP tent. Parking – We have partnered with Spot Hero and you may reserve a parking space in advance. Spaces are limited and you must pay in advance to reserve your spot. Details at baltimorewinefest.com. There is a water taxi stop (#16) at the venue, bicycle racks for parking bikes along the main entrance on Boston Street, and uber. Use promo code uberharbor to save on your first ride. Shopping – We have lots of great vendors! Be sure to check out all of the booths! Cooking Demos – We have several great demos lined up. The schedule will be posted soon on baltimorewinefest.com. Be Social! – twitter and instagram @bsceneevents and facebook.com/baltimorewinefest Don’t forget to use #BaltWineFest when posting! Save the Date & Purchase Tickets Now – B Scene’s next event is only a few months away – the 5th Annual Baltimore Seafood Fest (baltimoreseafoodfest.com) on September,15, 2018. Sip Responsibly – Everyone likes to sip. We just ask that everyone “sip responsibly.” Bartenders will not be permitted to serve intoxicated guests. We love Non-Profits - Several non-profits will be “pouring for a cause” including: Living Classrooms, Baltimore Dance Crews Project, Hampstead Hill Academy PTO, Soccer Without Borders, Baltimore Design School, Feline Rescue Association, and University of Maryland American Student Dental Association. This year, $10,000+ will be donated back to these fabulous non-profits. Weather – The event is rain or shine! Questions – Our management team will be ready to assist guests and will be at the front gate. Have a specific question prior to the event? Email Beth@bSceneEvents.com. 11am to 1pm – DJ J. Gray – A leading figure in Baltimore’s nightlife scene for more than a decade, J.Gray continues to be one of the city’s most appealing DJ’s. He has a one of a kind sound that is an amalgamation of modern genres and classic pieces. When asked what type of music he plays he often replies with a smile “Good Music” – because you can’t put music into boxes. J has played at and promoted several memorable weekly and one-off events in Baltimore’s hottest venues. 1:30pm to 3pm – The RWM Band – As a contemporary guitarist, Reggie’s Uptempo Rock-Edged Style developed from listening to Jimi Hendrix and B.B. King and fusing their influences with his own unique approach to create his "Boogie Woogie Rhythm & Rockin' Blues" that allowed him to tour Italy, France, Hawaii and the U.S. with an appearance at Carnegie Hall as a "Career Milestone.” He has the distinction of being the only artist to perform at the Baltimore Blues Society Festival nine consecutive years. 3:30pm to 5pm – The 8 Ohms Band - The 8 Ohms Band is a powerhouse lineup of players from all over the DC metro area. Bringing heaping doses of Horn Heavy Funk backing the vocals of I-Peace Unikue! Drawing from diverse musical backgrounds, The 8 Ohms are known for blurring the lines between hard groove, funk, soul, reggae and a slight taste of DC's own go-go music. Regardless of the music, the energy is undeniable & the 8 Ohms are masters at keeping the dance floor moving! 5:30pm to 7pm – Alter Ego - Alter Ego was formed in 2011 by bringing together the varying styles and influences of five of the area’s most active musicians. Focusing on a diverse mix of covers, featuring the best of Rock, Pop and Dance, Alter Ego brings one of the most entertaining, energetic and polished acts to the stage each and every night in the Mid-Atlantic area. Cooking Demo Tent Schedule: Coming soon! For any questions, please email Beth@bsceneEvents.com. Thanks!